Baptist Health's CEO Steve Hanson resigned this week after three years at the helm of the Louisville, Ky.-based system. The health system did not give a reason his departure, but the nine-hospital health system has been struggling financially. At the end of fiscal year 2016, the system posted a $41 million operating loss, the Courier-Journal reported. The not-for-profit also announced earlier this month it would lay off 288 employees. 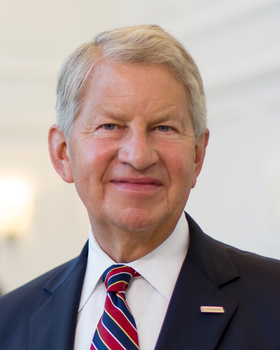 During Hanson's tenure, Baptist Health experienced some growth. It acquired Floyd Memorial Hospital and Health Services, a 236-bed hospital in New Albany, Ind., for $150 million last year. The system also joined a statewide collaborative with nine other health systems to share best practices in an effort to combat poor health outcomes and reduce costs. A nationwide search for Hanson's replacement has begun, Baptist Health said. Janet Norton, VP and chief legal and regulatory affairs officer, and Steve Oglesby, chief financial officer, will serve in interim executive roles. Prior to joining Baptist Health, Hanson was executive VP and operations leader for the Dallas-Fort Worth region part of Texas Health Resources. Before that, he was president and CEO of Appalachian Regional Healthcare in Lexington, Ky.
Baptist Health's annual revenue exceeds $2 billion, according to its site.